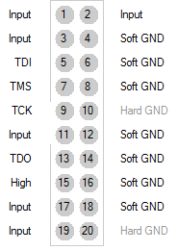 Let’s examine each area in turn and how it relates to your connector choices. The physical size and packaging of your circuit board will influence your choice of connector. Small devices such as cell phones may not have a connector at all and only have pads that are used for factory build, debug test and repair. Typically an in-circuit tester, flying probe machine or test fixture will be used to allow connection to the pads. larger boards will allow for larger connectors to be used and will often be populated with a connector for easy access for device programming, debug and test. Security is a major concern for many vendors of consumer products like cell phones, iPads, etc. These types of products are often hacked and reverse engineered, Using JTAG and other techniques, so that counterfeit products can be made and sold on the black market. In other cases, devices may contain sensitive information or Intellectual property that needs to be protected. In cases like this, the manufacture will often not populate JTAG headers or in some cases not bring out connections to the interface at all. Pins are sometimes spread throughout the board as test points in order to obfuscate the use of the pins. For manufacturing and debug a test fixture is often designed to provide access to the pins during manufacturing, These pins can later be encapsulated to further deter access. Test points – Pads on a PCB to allow connection to JTAG pins when the board is placed in a test fixture. Here is a list of popular JTAG connector vendors. Samtec – High-speed JTAG cables and connectors Tag-Connect – Innovative method to connect to the unit under test with out placing a socket on your board, saves space and cost. Ironwood – custom sockets to break out signals from high-density and surface mount devices Emulation technology – custom device sockets to break out hard to access signals from high-density and surface mount devices Digikey – JTAG Debugger and tool sockets, connectors and adapters cutedigi – JTAG multi-connector board – breaks out 20-pins to various standard headers Signal integrity in Test Fixtures App Note DFT Guidelines – Includes connector signal guidelines If you have suggestions for additional resources, please let us know.